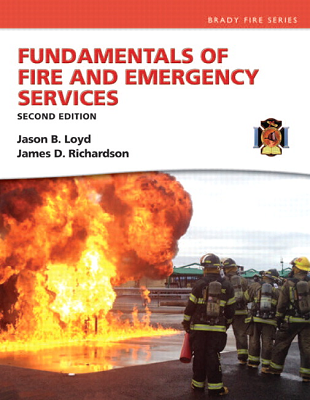 Fundamentals of Fire and Emergency Services, Second Edition, is designed to introduce students to the firefighting profession as well as provide career firefighters a resource for continued learning. Offering a comprehensive overview of the fundamentals of modern fire service, the text covers the history of the fire service, career opportunities and education, fire dynamics, fire prevention, and more. With an emphasis on critical thinking, each chapter follows the FESHE curriculum and outlines specific learning objectives that address the ever-increasing challenges of this dynamic profession. Online supplemental teaching materials are available to help instructors and students get the most from their Fire Science course. Resource Central, accessed through www.bradybooks.com, offers instructors online supplemental teaching material, such as test banks and customizable PowerPoint lectures to aid in the classroom. These instructor resources are also available through Pearson’s Instructor Resource Center. Students have access to a variety online study aids tailored to their fire service course.